CELTIC FC Foundation hosted a fundraising Gala Dinner in London on Thursday night and it proved to be a huge success. The venue was the stunning Four Seasons Hotel at Ten Trinity Square and it was an intimate gathering with around 120 invited guests, including Celtic legends, Tom Boyd and Stiliyan Petrov. Our sponsors for the evening included Caviar House & Prunier, Eland Cables, Intelligent Car Leasing, HW Fisher & Company, Eden Mill St Andrew's, Timeless Candles Scotland and a number of other incredibly generous organisations. Hosted by Peter Martin, the evening kicked off with guests being led into the ballroom by piper, Rob Watt followed by an introduction video piece on the work of Celtic FC Foundation and a few words from Chief Executive, Tony Hamilton. During the meal, guests were treated to a live music set from the fantastic Troubadours, who made their way around the tables, providing their own unique brand of entertainment. Following the main course, it was time for comedy with a man who has had an incredibly successful career in the business spanning over 30 years, Rory Bremner. 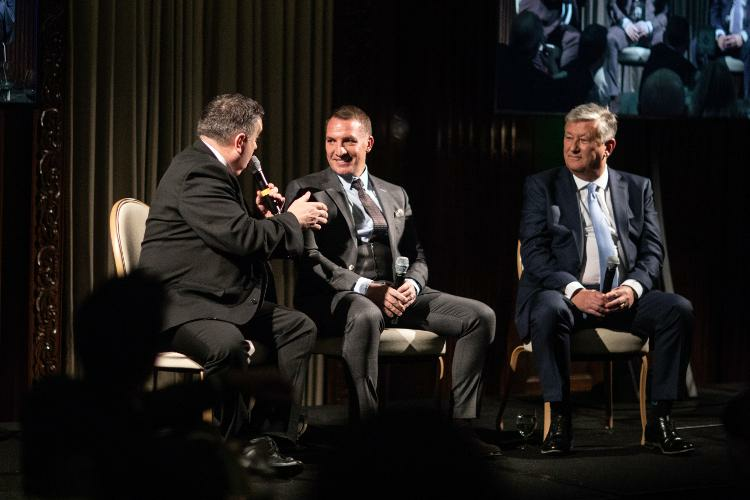 After dessert, Peter Martin invited Chief Executive, Peter Lawwell and manager, Brendan Rodgers to join him on stage for a Q&A as both men shared special memories from their respective periods at Celtic and their hopes and ambitions for the future. Just before the live auction, Celtic FC Foundation project participant, Sarah Rhind, shared her very powerful and emotional journey with guests and the huge part the Foundation has played in her recovery. Inspirational and touching, Sarah received a standing ovation as she left the stage. The live auction contained a total of 10 outstanding prizes and these were complemented by a further 24 in the silent auction. The formal proceedings were then rounded off by a Red Hot Chilli Pipers live set which had every guest on their feet. The party then moved to the Merchants Hall to continue the evening, with top class entertainment provided by the Dublin Legends. We would like to thank all event sponsors, those who donated prizes for the auctions, every guest who attended, Peter Lawwell and Brendan Rodgers, Tom Boyd and Stiliyan Petrov, Rory Bremner, Sarah Rhind, Rob Watt, the Troubadours, the Red Hot Chilli Pipers, the Dublin Legends and our host, Peter Martin. Please don’t ever underestimate the difference you have made.